Whole grains are growing at a remarkable rate – proving in market after market that consumers worldwide are beginning to understand the importance of enjoying more whole grains. To help those of you in the media paint the complete picture, we’ve collected industry ﬁgures, with the latest information ﬁrst, to document the whole grain surge. • in 61 countries: Argentina, Australia, Bahrain, Bangladesh, Barbados, Belgium, Belize, Brazil, Canada, Chile, China, Colombia, Costa Rica, Denmark, Dominican Republic, Ecuador, El Salvador, Egypt, France, Germany, Ghana, Greece, Guatemala, Honduras, India, Ireland, Israel, Italy, Jamaica, Japan, Kuwait, Lebanon, Maldives (Republic of), Mauritius, Mexico, Nepal, Netherlands (Kingdom of), New Zealand, Nicaragua, Oman, Panama, Paraguay, Peru, Poland, Portugal, Qatar, Romania, Saudi Arabia, Singapore, South Korea, Spain, Sri Lanka, Taiwan, Tanzania, Thailand, Trinidad and Tobago, U.A.E., United Kingdom, United States, Uruguay, and Venezuela. • By 409 WGC member companies based in 22 countries. • At last count, 26% of all Stamped products can be found outside the United States. Click here to learn more about the success of the Whole Grain Stamp. According to the American Bakers Association 2019 Study, millennials and Gen Z responded that “whole grains,” “freshness,” and “natural ingredients” are the most important nutritional descriptors across all product categories of baked goods. Over the past 3 years, Aramark, the largest U.S.-based food service company has achieved a 9% increase across whole grains, fruits, and vegetables, as part of the Healthy Life for 20 by 20. New Nutrition Business released a survey of 3,000 people from the United Kingdom, Australia, Spain, Brazil and the United States about which foods people think are good for digestive health. Overall, 61% recognized that whole grain choices were good for digestive health, and only 4.5% thought that whole grains were bad for digestive health (the lowest of any of the 11 categories included). Only fruits, veggies, and yogurt scored higher in consumers minds, at 83%, 78%, and 69%, respectively. Data presented at the 2018 World Pasta Day meeting indicates that sales of whole wheat pasta are expected to grow by 18% in Italy, and that the sales of specialty pastas (such as those made with farro or Kamut®, are expected to grow by 12%. Brown rice sales have increased by 40% at NTUC Fairprice (Singapore’s largest supermarket chain), in the six months leading up to March 2018. NTUC Fairprice and other retailers have also oﬀered periodic discounts on healthier products, like brown rice, to encourage better nutrition. In Euromonitor’s “8 Food Trends for 2018” report, healthy living is recognized as one of the eight megatrends, with ancient grains being called out as an example of this trend in action, and consumers’ preference for “naturally functional” foods. Additionally, Euromonitor lists baked goods, savory snacks, and confectionary as top categories to watch for innovation — all of which are well suited for reformulating with more whole grains. In the International Food Information Council’s (IFIC) 2018 Food and Health Survey, whole grains top the list of components considered to be healthful by consumers, following only vitamin D and ﬁber. Consumers are also diﬀerentiating between whole grains and enriched grains, as more than 80% recognize whole grains to be healthy, but less than 45% think that enriched grains are healthy. According to a food consumption analyst at NPD Group, their survey data shows that consumers are looking to achieve better overall wellness through their eating habits. They are doing this by seeking out nutrients like protein (56% of consumers), whole grains (52% of consumers), dietary ﬁber (51% of consumers), and vitamin C (50% of consumers), while avoiding ingredients like sugar. According to NPD’s SupplyTrack®, a service that tracks products shipped from distributors to more than 700,000 foodservice operators, case shipments of quinoa and amaranth increased by 18.5% and 19.4%, respectively, in the year ending October 2017. Similarly, spelt and farro also experienced double-digit growth in case shipments over this time period. According to the Hartman Group’s 2017 Health and Wellness Report, 58% of consumers are seeking more whole grains in their diet. The report suggests that this is driven by an interest in ancient grains, ﬁber, mindful sourcing, and overall wellness. Comparatively, 63% are seeking more ﬁber, 60% are seeking more protein, 59% are seeking more vitamin D, 57% are seeking more nuts and seeds, 42% are seeking more omega-3 fatty acids, and 32% are seeking more plant-based protein. According to a survey from the Grains and Legumes Nutrition Council in Australia, less than half of people today (47%) choose to limit the amount of grains they eat, compared to 60% in 2014. This is likely because interest in Paleo, low-carb, and gluten-free diets is waning. According to a new report from Technavio, the global whole grain foods market is expected to grow at a compound annual growth rate of 6.71% from 2017-2021. The report ﬁnds that sprouted grains are an especially popular trend, and suggests that one of the major drivers for this market growth is the signiﬁcance of the health beneﬁts of whole grain foods. The report warns that identifying whole grain foods may be a challenge for the market — all the more reason for makers of whole grain foods to utilize the Whole Grain Stamp! According to US National Survey Data (NHANES), whole grain intake signiﬁcantly increased across all age groups from 2003/2004 to 2013/2014, moving from 0.6 ounce equivalents per day to 0.9 ounce equivalents per day. Additionally, intake of reﬁned grains signiﬁcantly decreased during the same time period, moving from 6.3 to 5.7 ounce equivalents per day (a nearly 10% decrease). According to a report on the market for pasta from Market Research Future, “Whole grain pasta and gluten free pasta have shown highest potential in the market.” The overall pasta market is expected to grow at a compound annual growth rate of 5.85% from 2016-2023. In the International Food Information Council’s (IFIC) 2017 Food and Health Survey, whole grains top the list of components considered to be healthful by consumers (84%), following only vitamin D (88%) and ﬁber (87%). In fact, the percentage of people recognizing whole grains as healthful is signiﬁcantly higher compared to the previous year. Addtionally, more than 65% of consumers report that they are eating more foods with whole grains compared to years past. Older adults (ages 50-80) in particular are more likely to eat more foods with whole grains, compared to 18-49 year olds (70% vs. 62%). Download the full report here. According to the Consumer Goods Forum Health and Wellness Report (developed in partnership with Deloitte), a global survey of more than 100 of the biggest consumer goods and food companies, more than 180,000 products have been reformulated in 2016. Increasing whole grains is a key target for 25% of respondents, along with decreasing sodium (67%), sugar (61%), saturated fat (50%), and trans-fat (47%). The companies surveyed also overwhelmingly supported providing transparent, fact-based information to help shoppers make informed decisions. According to the National Restaurant Association’s 2017 Culinary Forecast, ancient grains are a top (#14) food trend, along with protein rich grains/seeds (#17). Non-wheat noodles (#33), farro (#50) black/forbidden rice (#53), and quinoa (#81) also made the list. Additionally, healthful kids’ meals were named as the #3 food trend of 2017, and of all of the aspects of healthful kids’ meals that stand out to chefs, whole grain items in kids’ meals (#16) got top billing. Download the full report here, or check out our summary blog. According to a report from Stratistics MRC, the market for Global Whole Grain and High Fiber Foods (estimated at $29.4 billion in 2015 ) is expected to grow at a compound annual growth rate of 6.6% through 2022, reaching $46.2 billion, with especially strong growth in the baked foods segment and in the Asia Paciﬁc region. Researchers credit this demand to the improved tastes of whole grain foods, as well as increasing demand for nutritious products. In a September 2016 report called “Better For You Eating Trends,” Mintel reports that, “well ahead of other ingredients, consumers are interested in protein (63%), ﬁber (61%), and whole grains (57%) when purchasing foods they consider to be healthy,” and that nearly ⅖ of consumers (38%) agree that healthy foods are worth the added expense. According to the “Shopping for Health 2016” report from the Food Marketing Institute and Rodale, a product’s healthfulness for children inﬂuences 91% of parent’s food and beverage purchases. In the same report, 43% of shoppers reported buying more whole grain foods. According to the 2016 International Food Information Council (IFIC) Food and Health survey, more people are trying to avoid enriched grains (21%) versus seek them out (20%). Additionally, 76% of respondents rate whole grains as “healthy” (compared to only 33% for enriched grains), and 1 in 5 people have an improved opinion on the healthfulness of whole grains (in fact, 7 in 10 of these people report that they’re consuming more). Download the full report here, or check out our summary blog post. Nearly two-thirds of Americans are making at least half their grains whole, according to the 2015 Whole Grains Consumer Insights Survey from Oldways Whole Grains Council. Rather than reprint all the trends and facts in this survey, we’ll simply link you to our blog written after the survey was released in August 2015. In a 2015 international report from HealthFocus International, called “Fiber, Grains, and Gluten — A Global Perspective,” 71% of respondents (spanning 16 countries, across the Americas, Europe, and Asia) reported that they want whole grains as a source of nutrition in products. The report also found that the international awareness of ancient grains was up from 26% in 2012 to 28% in 2014, with 35% of the respondents expressing an interest in ancient grains. Fiber, a nutrient prevalent in many whole grains, was also a big area of interest for many people in the survey. According to Datassential’s 2016 Trending Grains Report, the term “whole grain” is mentioned on 45% more menus now, compared to four years ago. Quinoa leads the way, appearing on 9% of all menus, and an impressive 22% of fast casual menus. Farro and Barley each appear on 3% of all menus and farro has a place on 13% of ﬁne dining menus — a sign that chefs and foodies alike are being drawn to its fuller, nuttier ﬂavor and satisfying texture. In a December 2015 survey of approximately 2,000 Americans, research ﬁrm Mintel found that 30% of respondents are interested in, and would pay more for, menu items that feature whole grains. This interest in whole grains is greater than the interest in non-GMO (29%), high ﬁber (28%), low sodium (26%), low sugar (26%) and gluten free (22%). Mintel also found that 21% of respondents order more whole grains at restaurants than they did the year prior, and that 53% are ordering them in the same amount. Food Formulation Trends: Ancient Grains and Sprouted Ingredients, a September 2015 report from market research ﬁrm Packaged Facts, found that nearly a ﬁfth (19%) of American adults have purchased menu or grocery items with ancient grains in the past 30 days (the same percentage as for sprouted grains/ingredients). A May 2015 survey found that 47% of consumers think rice contains gluten, and 34% believe that potatoes do. In fact, 5% think gluten is found in all carbohydrates! More than 1200 consumers surveyed in 2014 about how their values inﬂuence what they purchase in the deli. When asked to name the most inﬂuential claims in the deli, most cited were “local” (73%), “whole grain” (71%), “all natural” (69%), “no high-fructose corn syrup” (63%), “hormone free” (60%) and “grass-fed/pasture”(60%). Culinary Visions Panel, referenced in Deli Business, Feb/Mar 2015. A very small group — just 2.5% of U.S. households — accounts for 68% of gluten-free product sales in grocery stores; this group buys about 48 GF products for total spending of $185 annually. 18% of GF sales come from households purchasing just 6 GF products and spending $24 annually (less than 1% of their total annual grocery purchases. Light users account for the ﬁnal 14% of sales, averaging 2 GF products for $6 annually. Interesting to note: households that made the most GF purchases still bought, on average, the same amount of regular bread, breakfast cereal, pasta, muﬃns and bagels as the average U.S. household. Full report here. • 67% of Americans think whole grains are the most important item they look for on packages. • 70% are trying to consume more whole grains. Read our blog about the survey, or connect to the full IFIC report. According to data from SPINS, a leading supplier of retail consumer analytics and insights, sales of ancient grains rose steeply in the 52 weeks ending July 13, 2014. Kamut® brand khorasan wheat saw the highest growth, at 686%, with spelt growing 363% during the same period. Gluten-free ancient grains also showed strong sales, with amaranth up 123% and teﬀ up 58%. Click here to download a SPINS’ infographic detailing these sales trends and others – including the fact that packaged grains bearing the Whole Grain Stamp were up 19% during the past year. Global launches of new products made with quinoa rose 50% in the twelve months ending September 30, 2013 — and increased more than ﬁve-fold from Q3 2008 to Q3 2013. 38% of launches promoted their gluten-free properties. According to the 2012 Food & Health Survey from the International Food Information Council (IFIC) Foundation, the presence of whole grains in a product is a strong factor in inﬂuencing consumers to buy a product. When asked what considerations drove their purchases, consumers’ top choices were calories (71%), whole grains (67%), ﬁber (62%), sugars in general (60%), sodium/salt (60%), and/or fats/oils (60%). A 2009 survey of more than a thousand adults asked those who claimed they were making an eﬀort to eat more whole grains to explain their reasons for making this eﬀort. 36% of them said “I enjoy the taste.” This was up considerably from a 2006 study (below) where 13% cited taste as a purchase motivator. Other popular answers included “Whole grain foods are healthier” (76%); “In order to get more ﬁber” (69%); “To ﬁll me up and help me lose weight” (53%); and “To get more vitamins and minerals” (44%). A Survey of Consumers’ Whole Grain and Fiber Consumption Behaviors, and the Perception of Whole Grains as a Source of Dietary Fiber. Kellogg Co., March 2009. A survey conducted by the American Dietetic Association asked consumers if they had been eating more, less, or the same amount of various foods over the past ﬁve years. 48% said they were eating more whole grains, while 45% said their whole grain consumption had stayed about the same. Consumers in the survey also reported increasing vegetables (49%), ﬁsh (46%), and chicken (44%), while decreasing beef (39%), pork (35%) and dairy (22%). In an interesting twist, gluten-free foods were among foods consumers said they were least likely to increase consumption of. In September of 2010, we shared the ﬁrst-ever data from our friends at SPINS and Mintel that proved products bearing the Whole Grain Stamp outsell similarly positioned products that don’t use the Stamp. When ﬁrst reported, sales of natural foods and beverages with the Whole Grain Stamp had increased 12.8% compared to a year earlier, while those without the Stamp increased 9.5% in the same channels. As part of our ongoing partnership with SPINS, we’re pleased to announce that naturally-positioned foods and beverages* bearing the Whole Grains Stamp continue to outpace the competition. In Q1 of 2011 alone, combined sales of natural and naturally-positioned products approved for Stamp use totaled a whopping $13.1M, up 7.4% when compared to the same 12-week period in 2010. The long-range forecast of 52 weeks showed even more impressive growth, yielding a sales increase of $79.5M, up 11.1% over the same period a year previous. In May 2011, SPINS released information showing consumer demand for certiﬁcation labels beyond organic is on the rise. In addition to labels like Fair Trade and Non-GMO, the Whole Grain Stamp helped sales of products rise an impressive 13.3% for all of 2010. *”Natural and naturally-positioned products” as deﬁned by SPINS. For more information, please visit www.spins.com . New product launches of foods making a “whole grain” claim have grown sharply since 2000. In fact, according to the Mintel Global New Products Database, in 2010 almost 20 times as many new whole grain products were introduced worldwide as in the year 2000. Again according to Mintel, bakery, breakfast cereals and snacks now account for the largest number of new product introductions, with side dishes and meals gaining quickly. (This table got too wide so we eliminated alternate years – email us if you want the “odd” years.) 2012 data are through April 30, 2012. U.S. retail sales of whole wheat pasta reached $128 million in the 52 weeks ended Sept. 5, 2010, according to SymphonyIRI. Whole wheat pasta had an average selling price of $1.50, compared with $1.27 for regular pasta, and whole wheat pasta took up a 9% share of the pasta category. The retail sales covered U.S. grocery stores, excluding Wal-Mart Stores, Inc.
At Sara Lee Fresh Bakery, Downers Grove, Ill., the share of products with whole grain nearly doubled to 45% in 2010 from 24% in 2005, the company said. Sara Lee estimated overall share growth for the category at 27% in 2010 from 15% in 2005. Using Nielsen Homescan data, ERS researchers found that in 2001, whole grain products accounted for 11.1 percent of all pounds of packaged grain products purchased in grocery stores (excluding ﬂours, mixes, and frozen or ready-to-cook products). By 2006, whole grains’ share of total grain product purchases was 17.9 percent. ERS researchers found whole-grain breads accounted for 6 percent of all pounds of bread purchases in 2001 and rose to 20 percent by 2007. Over this same time period, whole-grain cereals jumped from 30 percent of all cereals purchased to 46 percent. performed annually by the International Food Information Council. In a survey conducted by Quaker Oats, 50% of the sample selected whole grain as the most sought after attribute when choosing breakfast foods. This was followed closely by ﬁber (47%). 37% of respondents identiﬁed “Increasing the consumption of foods with whole grains” as a Dietary Guideline-related action that they would be interested in doing. IFIC Food and Health Surveys 2011: Consumer Attitudes toward Food Safety, Nutrition & Health; performed annually by the International Food Information Council. 83% of consumers named “whole grains and reduced risk of heart disease” when asked about their awareness of various foods and their health beneﬁts. Two years ago, in 2007, only 72% were aware of the whole grain/heart link. Only Calcium/bone health and Vitamin D/bone health scored higher. In the same leading national survey, consumers named ﬁber (37%), whole grain (34%) and protein (28%) as the three food components they were most likely to choose to improve their own health – and calcium (39%, Citamin C (31%) and whole grain (26%) as the three they’d seek out most often for their kids’ health. 2009 IFIC Functional Foods / Foods for Health Consumer Trending Survey, August 2009, performed every 2-3 years by the International Food Information Council. Whole grains topped the list when consumers were asked to pick the healthiest foods from a list of 70 foods and beverages generally considered good for you – and garnered fourth place, too, with oatmeal. Whole grains scored 59.5%, followed by broccoli (57.6%), bananas (56.9%), oatmeal (56.1%), green tea (55.1%), garlic (54.6%), spinach (54.6%) and carrots (52.4%). When consumers were asked, unaided, to name a speciﬁc food or component with health beneﬁts, these were the top six foods named. 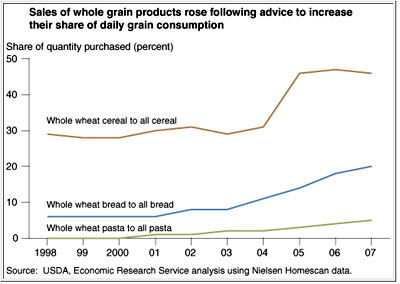 Compared to a similar survey two years earlier, awareness of whole grains grew 25% from 2005 to 2007. When asked about the speciﬁc beneﬁts of the top functional foods, 72% of these consumers (again unaided) associated whole grains with beneﬁts related to cardiovascular disease, and 86% associated both ﬁber and whole grains with intestinal health. While it is commonly believed that many consumers eat whole grains despite their stronger taste, we are learning that some consumers have come to prefer the fuller, nuttier taste of whole grains – and only ten percent of those surveyed reported never eating whole grains. Two surveys from the National Restaurant Association name whole grains as a hot trend for 2009. In the NRA’s annual Chef Survey, 1600 kitchen maestros named quinoa the top trend in side dishes, while ancient grains garnered third place in “other food items/ingredients.” In the category of “Culinary Themes,” nutrition and health took ﬁrst place. In a separate survey, NRA members were asked “What trend do you see accelerating the most in 2009?” Taking ﬁrst place — even over “productivity enhancements to oﬀset rising costs” was “Increasing attention to health/nutrition.” The bottom line: whole grains will continue to accelerate in 2009, and the WGC will be there to help consumers and manufacturers beneﬁt. A 2007 report from the International Dairy, Deli and Bakery Association (IDDBA) ranked the top 10 favorite breads for luncheon sandwiches. Wheat was number one, followed by Submarine/French (2), Multigrain (3), Sourdough (4), Croissant (5), Rye (6), Tortilla (7), White (8), Flatbread (9) and Pita (10). This growth compares to less than one percent growth in the whole grain market overall between 2000 and 2004.